I haven’t posted in a few days. We went to Maine for the Kneading Conference and had a wonderful time. But we did see something disturbing. This week I saw the new Jurassic Park movie. You know the plot: the dinosaurs come back and eat people, one limb at a time. Good and scary movie. That’s fiction. But then there is non-fiction. The dinosaurs were almost totally wiped out by a massive asteroid strike 65 million years ago. There was evolution, however, and the remaining dinosaurs morphed into today’s birds. You don’t think of birds as threatening as dinosaurs, but evolution never stops. 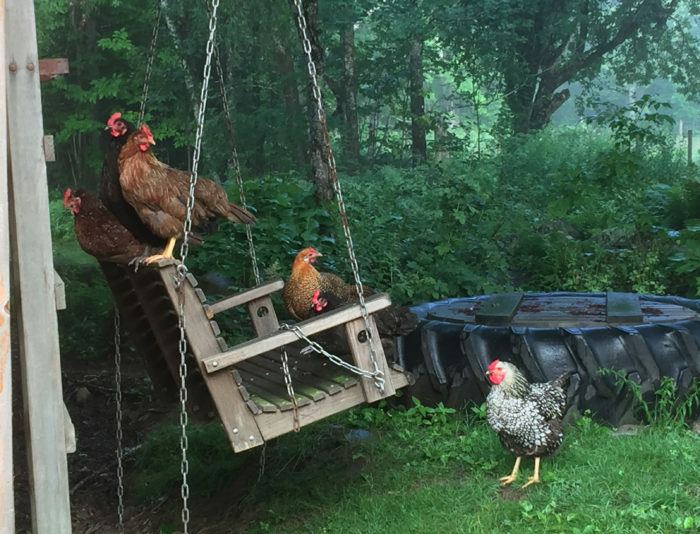 We stayed at an Airbnb in Maine and our lovely hosts have a herd of chickens. Evolving chickens. Look at how they dominate this swing. Suzi and I could not use it. And when I tried to take a picture of the chickens conspiring on a tractor, well, I was driven away. I’m telling you, chickens are getting smarter, bolder, and you had better consider the consequences before you barbeque. Well, perhaps I exaggerate about those birds. But not about the Airbnb. We stayed in Farmington, Maine with Bill and Victoria Blaine-Wallace. They were wonderful hosts and we enjoyed a huge, massively decorated apartment sitting atop their new country-style garage. If you need a place to stay in Central Maine, you want to stay here.